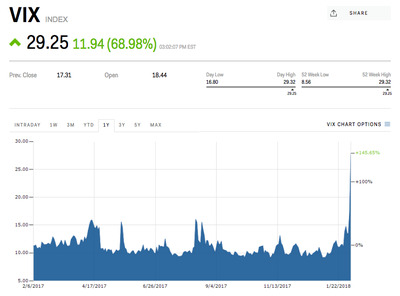 The Cboe Volatility Index, or VIX, spiked 84% on Monday, its largest single-day increase of all time, according to data going back to 1990. The price swings are a change of pace for a stock market that’s sat mostly unperturbed for months. The Cboe Volatility Index – or VIX – spiked 84% on the day, its biggest single-day increase of all time, according to data going back to 1990. The surge comes as stocks plunged, with the S&P 500 falling as much as 4.5% before recovering some ground. The VIX reflects expectations for volatility in the S&P 500, and trades inversely to the benchmark roughly 80% of the time. At the root of the selling are concerns over inflation and rising interest rates, which have pushed up bond yields at the expense of stocks. 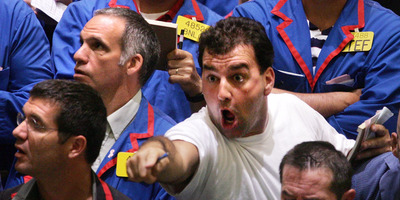 The stock market’s tried and true buy-the-dip strategy – which involves scooping shares up at attractive valuations following selloffs – has failed to rescue equities this time around. With that said, the VIX’s spike is good news for one person at least. The so-called “VIX Elephant” – who has repeatedly wagered on a volatility spike since July – is likely making a killing from the market’s big price swings.